1. Rye Croissant with House-made Jam at Pistacia Vera - There are dozens of dishes Pistacia Vera does better than anyone else, but the most unique among them is the rye croissant. Light and airy with a delicious texture and whole-grain flavor, they are topped with a sprinkling of caraway seeds. Ask for it warm with a side of berry jam (and a latte) and you&apos;ve got a perfect start to your day. 2. Zucchini Pronto at Basi Italia - Tucked inconspicuously in an alley in Victorian Village, Basi can be a challenge to find. Once you&apos;re there, the coziness envelops you. The zucchini pronto is the perfect start to any meal there - barely-cooked matchsticks of zucchini are coated in almonds slow cooked in olive oil, bright lemon and fresh parsley and covered in delicate sheets of aged pecorino. 3. Spicy Bahama Mama at Schmidt&apos;s Sausage Haus - This is old-school Columbus right here. Schmidt&apos;s is known for its sausage and its cream puffs, but the very best thing on the menu is this spicy pork sausage. Garlic and cayenne lend a unique flavor, and a good smear of Schmidt&apos;s own mustard is the perfect accompaniment. 4. Shrimp and Grits at G. Michael&apos;s - Low Country cuisine is a forte for this German Village bistro, and Chef David Tetzloff makes the best shrimp and grits this side of Charleston. 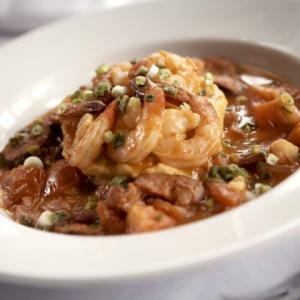 Plump shrimp are paired with spicy andouille sausage and country ham and topped with a decadent buttery tomato broth. If the weather is amenable, ask for a table on the patio. 5. Northstar Burger at Northstar Cafe - With locations at Easton, the Shorth North and Clintonville, tasting this burger will be easy, and we&apos;ll stake our claim that this is the best veggie burger anywhere. Made of brown rice, a little beet and some secret ingredients and served on a buttered bun with pickles, lettuce and onion, even meat-lovers appreciate the deliciousness of this sandwich. 6. Tacos al Pastor at Los Guachos Taqueria - Columbus&apos; taco trucks make national news, and this is one of the best. Find the iconic truck on the west-side or the brick and mortar location at Bethel and Godown. The $1.50 taco al pastor is the must-try item - pork slow-roasted with pineapple and topped with cilantro and diced onion with a sprinkling of lime - you&apos;ll get back in line for more. 8. Huevos Rancheros at Tasi Cafe - For a heartier breakfast, Tasi in the Short North is your pick. The huevos rancheros are elevated beyond the traditional and the result is delicious. Two poached eggs sit atop a bed of roasted tomato sauce with a slight kick of spice. The dish is garnished with a queso fresco- and black bean-filled tortilla - a definite step above toast! 9. Vieras - Barcelona - One of the most-ordered (and for good reason) dishes at this Spanish eatery combines seared scallops with bacon, lima beans and unexpected accoutrements like dates and mushrooms. 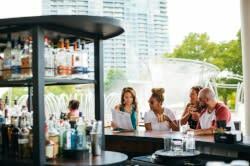 Ask for a patio table and sip a glass of cava and you&apos;ll be in heaven. If you think we&apos;ve missed one, snap a pic and tweet it to us @ExpCols or tag us in it on Instagram at @ExperienceColumbus!